Schoolchildren of Balara Elementary School actively participated in the fun and interactive learning session which was followed by a ceremonial washing of hands during the GHD kickoff on October 3. To help promote a healthier future, various local government units supported the country-wide and month-long celebration of the 2016 Global Handwashing Day (GHD) spearheaded by Manila Water Foundation (MWF) where over 130,000 individuals have been engaged to create lasting pledges to make proper handwashing a lifestyle in order to help eradicate the spread of communicable and easily preventable diseases. During a special leg conducted at the Quezon City Hall, Vice Mayor Joy Belmonte expressed the importance of spreading this advocacy for the constituents of the city. “Sa araw po na ito nakikiisa ang ating pong mahal na lungsod sa pagdiriwang ng Global Handwashing Day dahil ang isa sa mga adbokasiya po natin ay mabawasan ang child mortality. Ito po ay bahagi ng millennium development goals at ngayon ay patuloy pa rin nating ipinaglalaban,” (On this day, our beloved city joins the celebration of Global Handwashing Day because one of our mandates is to decrease child mortality, which is part of our millennium development goals.) she expressed. Quezon City Vice Mayor Joy Belmonte shared how the advocacy on proper handwashing can help address the problem on child mortality which is also one of the commitment of the local government. In a separate event for the Laguna leg held at Solenad, Sta. Rosa City Mayor Dan Fernandez also indicated his support towards proper handwashing by reiterating its importance in keeping one’s health. “Mahal na po ‘yung pagpapa-ospital, mahal na po ‘yung pagkakasakit and one of the basic things we can do [to prevent these] is to wash our hands and educate our people. So rest assured that the city government is with you in this endeavor. We are very thankful to Manila Water Foundation for coming up with this kind of project.” (Getting sick and hospitalization can be costly and one of the basic things we can do to prevent these is to wash our hands and educate our people. Rest assured that the city government of Sta. Rosa is with you in this endeavor. We are very thankful to Manila Water Foundation for coming up with this kind of project. ), he stated. Sta. Rosa City, Laguna Mayor Dan Fernandez expressed his support towards proper handwashing by highlighting its importance in maintaining once health. GHD, which is an annual international campaign held every 15th of October, was started in 2008 by the Global Public-Private Partnership for Handwashing. In the Philippines, MWF has been one of the most active proponents in promoting this advocacy that aims to prevent diseases in a cost-effective manner through a series of events promoting the advocacy on proper handwashing with soap and clean water. During the main GHD celebration attended by over 2,000 students, parents, and teachers at Circuit Makati, MWF President Ferdinand Dela Cruz reinforced the Foundation’s support for this annual international campaign by looking back on how it all started. 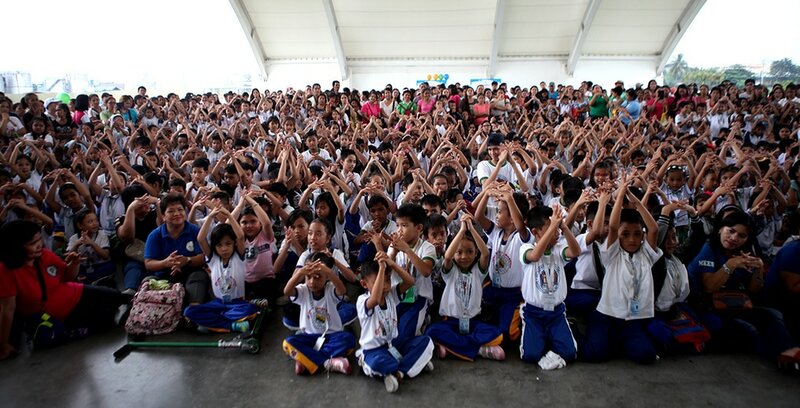 “Ang Manila Water Foundation ay matagal na ring sumusuporta sa Global Handwashing Day celebration. Kami po ay nagsimula sa Metro Manila at last year, kami po ay naging nationwide sa pag-promote ng Global Handwashing Day at hindi lang po isang araw kundi buong buwan ng Oktubre na idineklara namin [bilang] Global Handwashing month,” (For years, Manila Water Foundation has been supporting the Global Handwashing Day celebration which we started in Metro Manila. Last year, our nationwide campaign started where we declared the whole month of October to be the Global Handwashing month.) he shared. MWF President Ferdinand Dela Cruz heads the washing of hands during the Global Handwashing Day celebration held at the Circuit Makati on October 15. Also in the photo are DepEd Makati School Governance Operations Division Chief Claudio Rojo, Makati Health Department Head Dr. Bernard See, 2nd District Councilor Evelyn “Bing” Villamor, and MWF Executive Director Carla May Beriña Kim. Prior to the October 15 main event, MWF has taken the advocacy of proper handwashing to various school events, malls and communities. The festivities will continue up to the final day of the month wherein an estimated 5,000 on-site attendees are expected to participate and learn about the value of proper handwashing with soap and water. 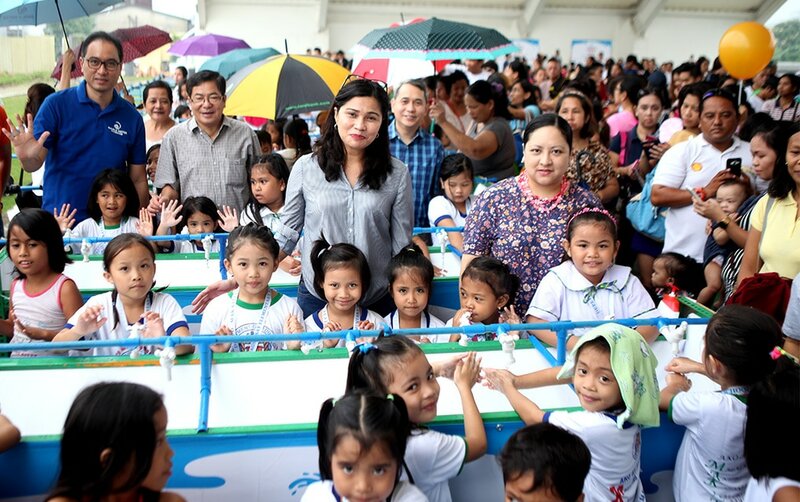 More than 2,000 schoolchildren, teachers and parents joined in the 2016 Global Handwashing Day celebration led by MWF at Circuit Makati and pledged to make handwashing a habit. MWF’s month-long and nationwide celebration of the 2016 Global Handwashing Day is co-presented by Scholastic and sponsored by Pilot, Ayala Mall Cinemas, Generika Drugstore, and Globe. Institutional partners include the Department of Education, The Mind Museum, Quezon City Health Department, Manila Water, Clark Water, Laguna Water, Boracay Water, and Cebu Water while the venue partners are UP Town Center, Market! Market!, Ayala Center Cebu, Solenad, D’Mall Boracay, Abreeza Mall Davao, Marquee Mall Pampanga, Glorietta, Local Government of Quezon City, Circuit Makati, and Hennan Regency Resort and Spa, Boracay. Helping promote the month-long activities and events are official radio partners Play FM 99.5 and Wish 107.5, as well as regional media partners Yes FM 91.1, Easy Rock 93.5, GMA 7 Boracay, and Paradise Cable Television Network, Inc.
Visit www.facebook.com/ManilaWaterFoundation for more details and photos.